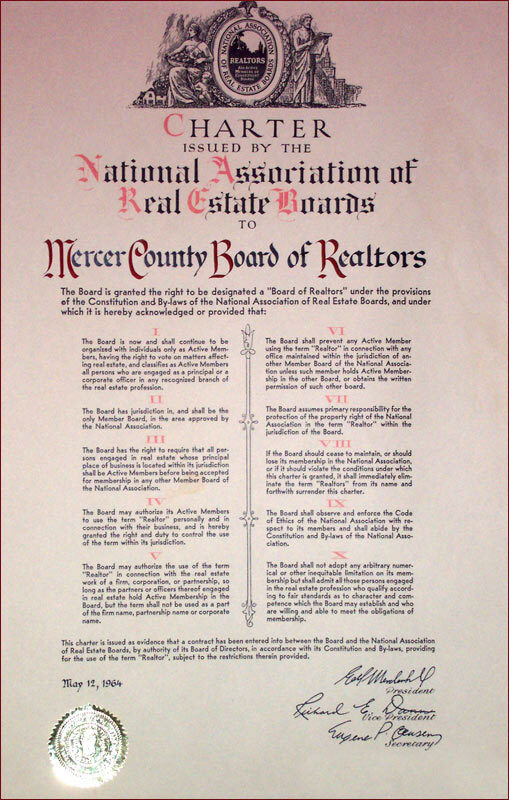 Mercer County Association of REALTORS® has been in business for nearly 90 years, a private trade association serving the needs of the community area REALTORS® and upholding the National Association of REALTORS® code of ethics. We exist as part of a family of associations, headed by the National Association of REALTORS®. Our parent association, New Jersey REALTORS®, governs and supports the actions of all county associations for REALTORS®. Located at the 1428 Brunswick Avenue, Trenton, New Jersey, the Mercer County Association of REALTORS® office is open from 8:30 am to 4:30 pm, Monday through Friday. The Association was granted its charter in 1921 and is currently governed by an elected Board of Directors: President, President Elect, Secretary/ Treasurer, Immediate Past President and 9 REALTOR® Directors and 1 Affiliate Director. Three full-time employees (including the Executive VP) and one part time employee complete the staff of the Association. M.C.A.R. represents over 2000 REALTOR® and Affiliate members from the Mercer County and surrounding areas. Volunteers appointed by the President serve on various committees to help improve and expand the projects, seminars and events, in an effort to service the needs of our members.